So begins Kaqtukowateketew, The Thundermaker, a storybook and animation by Atlantic Mi’kmaq artist, Dr. Alan Syliboy, inspired by the local Indigenous petroglyphs. 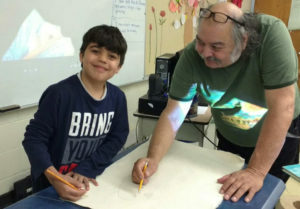 This Spring, DAREarts Champion and artist-educator, Alan shared his story and culture with sixty Gr. 6-8 students in three Halifax-area schools. In turn, the children each painted a 2’ x 2’ canvas that told their own story about Little Thunder. Sharing their paintings and cultural interpretations with each other, the children then each wrote a story to accompany their painting. Again they shared with each other and presented their stories in numerous ways – from reading to drama. 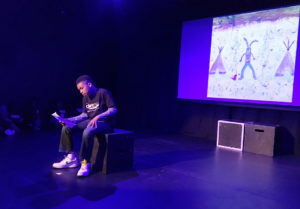 As a grand finale, all three schools’ students came together at the Bus Stop Theatre in Halifax and presented their works on stage in a public showcase. 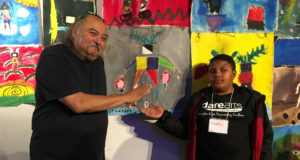 As measured by the children, parents, teachers and artist-educators, the two-month program was a triumph of the students learning, creating and DARE-ing to share each other’s individuality, voice, culture and what we all share: our country’s heritage. In small groups, we made visual representations of the DAREarts values of Discipline, Action, Responsibility and Excellence and then presented them to their classmates. We saw how positive Action leads to more positive Action. Then we wrote letters to connect with other schools in the DAREarts program. Kayla & Kassidy decided to translate their letter into Mi’kmaq! They taught their classmates and teachers how to pronounce some of the words so that they could share what they learned with other students. Nialah took action by accepting Brycen into her billboard-making group halfway through the project. Brycen was struggling for a way to add to the poster so she asked him constructive questions that allowed him to contribute. Suzan, Satina, and Rawyah, took the time to prepare an excellent speech about their Responsibility/Respect/Reflection poster that everyone in their group could be a part of. Alan Syliboy shared local Indigenous traditions and his stories in books, art and animated films. We learned about petroglyphs, the Stone Canoe, and Thundermaker and started working on making our own petroglyphs. Royce did an excellent job introducing Charlize to the DAREarts values and working together to make their petroglyphs fit into one story. After Paul had finished sketching his canvas, he decided to take Action and helped his classmates finish their sketches. Others followed his lead and soon the entire class was sharing compliments on their unique artwork with each other. Each of our petroglyph paintings come to life as our own Little Thunder story. Cassidy mixed an excellent shade of brown paint that everybody wanted to use. She shared her mixture with Sydney and Tyler, but when others needed more, she taught them how to make it themselves! The entire group of students really stepped up their game when it came to clean-up time: organizing art supplies, making their own team clean-up stations, helping each other get all the paint mess off of the tables and floors. Inspiration struck Adam as he started painting. He took time to reflect on some of the tips and tricks Dan had shared with him, and was the first to take action when it came to setting up everything he needed to succeed! Others noticed Adam’s excellent work and pushed themselves to paint like him – without fear of failure. At first, Queen, Corey and Amar had trouble working next to each other. But they collectively had the brilliant idea of sharing paint trays and water and even helped paint each other’s pieces. We put the finishing touches on our petroglyph paintings and starting making stories inspired by our work and the stories of Little Thunder and the Stone Canoe that Alan Syliboy shared with us. 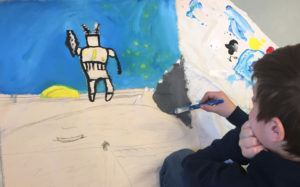 Tyler was the first to finish his painting and, after workshopping a few story ideas, he decided to help his classmates finish up their paintings. His entire table followed suit and everybody worked together as a group to finish up everyone’s paintings while respecting each other’s individual vision. Melania started transforming her painting into a story. She focused on her incredible sunset backdrop and made a story about Little Thunder painting his own portrait, just like the students! Jack and Adam really took a shine to acting out their stories, and both bravely volunteered to be the first to share their work with the class. Kimora and Zaria did an excellent job keeping each other on task and inspiring everyone around them. We turned our petroglyph paintings into written stories and then worked on tableaux and narrative skills to bring our stories to life! After one group discovered how all their individual paintings fit together like a puzzle, Sydney took action and led the team to turn their new collage of paintings into a story that combined all their art together! Alex and Mitchell were incredibly disciplined when they were rehearsing their physical stunts to add into their performance. Their tree wowed everyone! Maddie and Jack did an excellent job sharing their work with everyone at the end of the day and Tristan and Logan, showed excellent leadership skills as they led by example in group activities. Tirene, Diamond, and Savannah helped their classmates find places to work, sharing paints with those who needed extra, and offering tips and tricks that they learned from their own art practices. We put the finishing touches on our petroglyphs and rehearsed all our stories for the showcase on June 5th. Alan Syliboy joined us to see our work over the past weeks! Alex took action and led everyone in a group exercise to get warmed up for our performances. 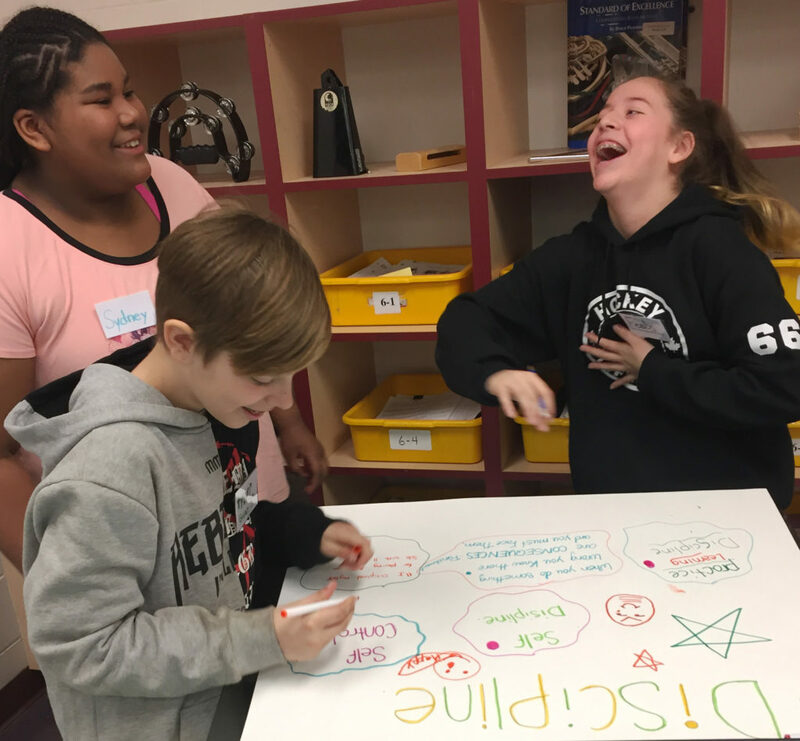 Kayla, Cassidy and Prezley incorporated one of their drama games into their creative process to find an ending for their story. Logan showed excellent discipline skills and led by example as his group figured out how best to structure their rehearsals. Cortel, Robert and Tiana took action in bringing Cortel’s flower story to life in a way in which everyone could engage! Ahmet finished his multilayered masterpiece! After covering his entire canvas in a thick layer of paint during our last session, he came back ready to get the job done and added detail in a whole new way that really makes his painting pop! Rahlia, Rhoda and Suzan all worked together to rehearse an “introduction to the art” with Henri for the showcase. They are really thinking outside the box for ways to be extra involved. 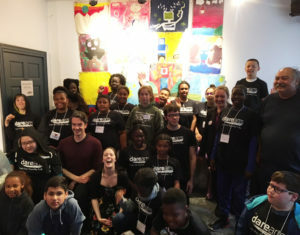 The DAREarts workshops culminated in the students adopting a leadership role by sharing what they had accomplished in DAREarts with younger children. 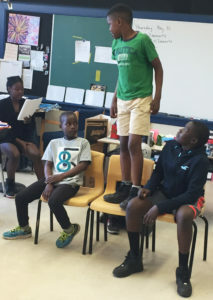 Then, on June 6th at the Bus Stop Theatre in Halifax, the students from all three schools gathered, meeting each other for the first time and sharing their experiences and creations with each other. They brainstormed, rehearsed and presented to a public audience with poise and confidence! to Mi’kmaw artist Alan Syliboy, coordinator and artist-educator Henricus Gielis, artist-educators Gina Thornhill and Dan Gervais and teacher Trish Gibbon. 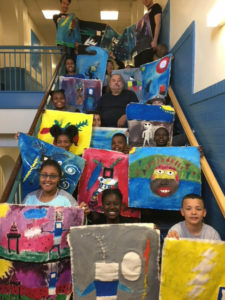 to DAREarts schools and teachers; Riverside ES & Simon Gatto; Joseph’s Alexander McKay ES & Paulette O’Connor; Joseph Howe ES & Otis Daye, Bobbi-Leigh Cain. to our key supporters for making our DAREarts Atlantic program possible: The McCain Foundation, Northbridge Insurance, Scotiabank, RBC Foundation, Halifax Airport Authority, The Bus Stop Theatre and all of our volunteers!